Thanks to everyone who joined in the fun & submitted their #visitbluemtn photos this season. Congratulations to our winner, Nora Iliakis! Some of you may ask, "What is R.D.?" Well, R.D. stands for recently disgorged, a concept devised by Madame Bollinger in the early 1960s. Take a look at the picture of the back label of our Brut Rose sparkling wine to view the disgorgement date, May 2014. While on the front label we label it R.D. 2010 (the vintage the grapes were grown in). Méthode Traditionnelle sparkling wines goes through a primary fermentation in the tank and a second fermentation in the bottle. Once the wine goes through its second fermentation in bottle it is left to age on its lees, the dead yeast cells. 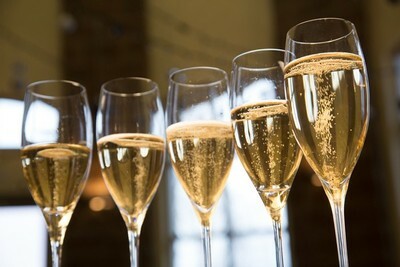 At this time, the sparkling wine continues to age for several more years resulting in a toasty, yeasty characteristic. Next we need to disgorge, remove the yeast cells from the wine and then it will be ready to drink. This is when we will date the disgorgement date on the label and it is titled R.D. This special aging on the lees allows the wine to maintain a unique combination of freshness and liveliness, while developing delicate and complex aromas. Sparkling wines benefit from a prolonged maturation on its lees reinforcing the aromatic subtlety and complexity of the final wine. Below is our disgorging line. The first image shows all of the sparkling bottles with their necks down in a glycol bath. Whereas the next image is the bottling line where the dosage is added. Next time you pick up a bottle of sparkling wine please go ahead and take a look at the label and look for the disgorgment date! Looking for a spot in the Lower Mainland to enjoy a glass of Blue Mountain Sparkling? Blue Mountain NV Brut "Gold Label"
Blue Mountain Brut Rosé R.D. Check back on Thursday for Christie's blog on R.D. - Recently Disgorged. The old adage is sparkling with everything. But is that really true? When pairing sparkling wine and food the acidity of the wine is key. There are some classic pairings – caviar, oysters – but there are also more unexpected foods that might surprise you. Potato Chips - Take a lesson from the Brits, the crunch, saltiness and fattiness of a great potato chip will sing with a sparkling wine with some good acidity. Sparkling Rose is also an extraordinary match, both will make the other better. Sushi and an extra dry sparkling refreshes the palate between bites of raw fish and delicate sushi rice. Some of the compatibility comes from the high yeast content of both Sparkling and soy sauce. Indian Food! Crunchy poppadoms can be perfect with Sparkling. Makes a great snack or starter, kick it up with some mint sauce, mango chutney or raita. Breakfast, more specifically eggs, a rich eggs benny and your favorite sparkling are the best way to start your day. Cheeses - Full-bodied Sparkling pair quite well with hard cheeses such as Cheddar, Gouda and Parmesan while lighter bodied Sparkling complement soft cheeses such as goat cheese and brie. Fish n Chips, another British specialty. The mousse or fizz of the bubbly work with the crispy skin of the chips and the acidity again cuts through the oil in the batter. Casual but elegant. 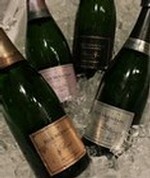 Fruit, different types of fruit naturally, sit better with different types of Sparkling. At the top of the fruit list are berries. They lend a sweetness to the palate that accompanies the flavour of a light sparkling. Stone fruits such as peaches and plums can also pick out some of the flavours in Sparkling. Sparkling does go with everything but try it for yourself. Experiment with a wide range of foods. You could even host a party where everyone needs to bring bubble and something to try with it. Either way it is meant to be fun. 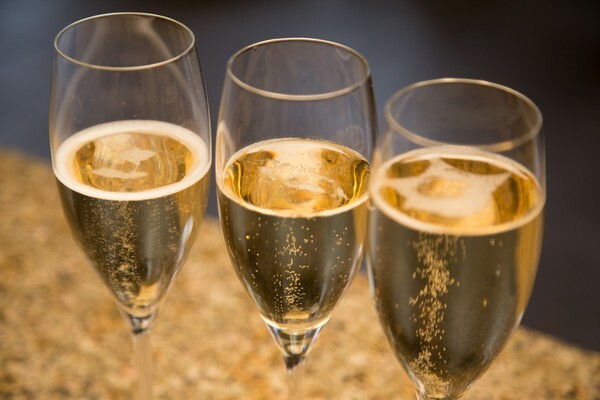 Let us know what your favourite pairings are with sparkling wine. Most importantly enjoy! 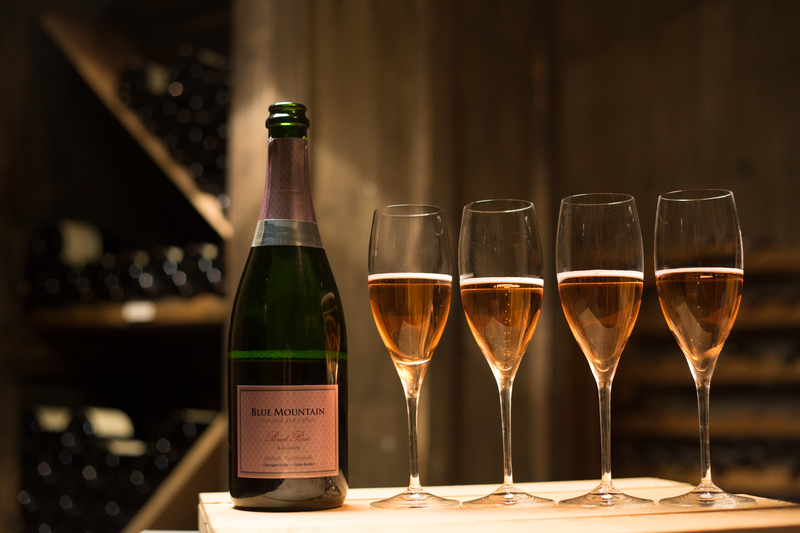 Our 2010 Brut Rosé R.D., 2007 Blanc de Blancs and 2006 Reserve Brut will be released on Monday, October 27th. Check back next Tuesday for Chantelle's blog, "Where to enjoy a glass of Blue Mountain Sparkling in the Lower Mainland and Whistler". Busy planning your Thanksgiving feast? You should also think about wine pairings. Nothing quite says "Celebrate!" like a glass of bubbly! 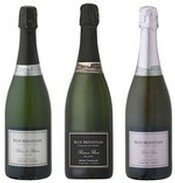 Start off the festivities with at least one bottle of our NV Brut "Gold Label" or 2006 Blanc de Blancs sparkling wine. Our 2012 Chardonnay will be perfect to enjoy with your delicious thanksgiving turkey, roast potatoes and lots of classic vegetable dishes. How about Gamay for Thanksgiving this year? Our 2013 Gamay Noir is light enough for appetizers and can carry through the main course. Do you have another wine pairing to recommend for Thanksgiving? Please share it in the comments section below. Made in the century's old cheese making tradition of Europe, Kootenay Alpine Cheese wanted to create specialty cheese that reflected the landscape, culture and life of the place it comes from. Towering over Mountain Valley Farm pastures is the magnificent Thomson Mountain range. The farm is situated in the heart of the Kootenays, on benchland above the Creston Valley, 10 minutes from the Idaho border and 4 hours from the Alberta border. Mountain Valley uses no pesticides, GMO’s or chemical fertilizer on the land. They nurture and replenish the soil through many sustainable management practices, including the application of composted manure from the farm and whey from their new cheesemaking facility. 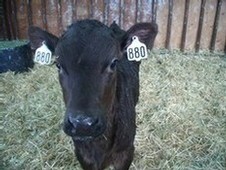 The health of the herd is maintained following organic practices, with no hormones being used. They are certified organic with Pacific Agricultural Certification Society and also belong to Kootenay Local Agricultural Society whose mandate is to foster local, sustainable agriculture. These farmstead cheeses are handcrafted following the tradition of artisan cheese-makers, and made using only the raw milk from their own certified organic herd. Each cheese is carefully aged in order to develop a rich, complex flavor that is unique to the milk, their farm, and their region. Pinot Gris & NOSTRALA: “Of this place.” A firm cheese with mild earthy notes, a subtle creamy texture, and a pale golden interior. Resembles a firm Italian Fontina, often referred to as the Italian cousin of French Gruyere. NV Brut Sparkling & MOUNTAIN GRANA: A hard cheese modeled after an Italian Piave with a dense grainy texture and a sweet flavour, with hints of nuts and fruit. With extra aging, a full-bodied flavour develops, resembling a young Parmigiano Reggiano. Chardonnay & ALPINDON: “Gift of the Alpine,” Their premium cheese, is a firm cheese carefully modeled after French Beaufort d’Alpage. Following centuries old tradition this cheese is hand-rubbed and made only with milk from summer pastures. It exhibits a smooth nut flavour, a complex finish, a rich golden interior and a dark textured rind. Additional aging concentrates its flavours, deepens its complexity, and increases the sweet crystals that develop throughout the body of the cheese. Wine Serving Temperature - What's best and why? 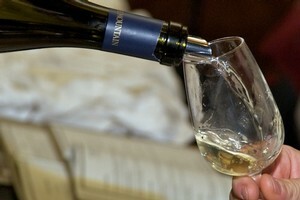 Quite often we serve our white wines too cold and our red wines too warm. When this happens white wines can appear tasteless and red wines might come across as bitter. There are a few reds that do benefit from being slightly chilled especially in the warm summer months. For lighter and fruitier reds such as Gamay Noir and some Pinot Noir putting them in the fridge for about 45 minutes and then let them come to room temperature for about 20 minutes will create similar circumstances to what home temperatures were like when all the talk started about serving reds at room temperature. Chilling these reds will focus their flavours and make the wine taste more refreshing. Around 12 - 15C. White wines like Pinot Gris, Sauvignon Blanc and Pinot Blanc can be chilled for about 1 1/2 hours in the fridge and then 20 minutes to warm up and then served they should maintain their crisp light refreshing flavours. Around 10C. With heavier whites like Chardonnay a little less time in the fridge, about 45 minutes and then about 20 minutes to come to temperature should showcase the rich full bodied flavours Chardonnay is known for. With Sparkling wine a couple hours in the fridge is perfect as you want to maintain the crispness and microscopic bubbles in the glass. 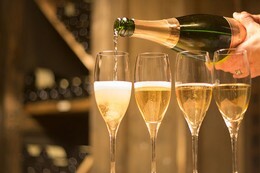 Sparkling wines should be chilled to 6 - 7 degree C. This slows the release of bubbles. Not only does the wine stay lively longer, it keeps its fruit aromas and bouquets longer. One last thought is that it is easier to warm a wine up in the glass than it is to cool it down so err on the side of cooler. By experimenting a bit with some of your favourite reds and whites you might find you like them even more at the correct temperature. It is our third official season for the tasting room to be open with no appointment necessary. We are now open daily from 11am to 5pm for you to drop by to taste and purchase our wines. I am very fortunate to have a handful of knowledgeable staff to guide you through your wine tasting of Blue Mountain wines and make helpful recommendations for visits to other wineries, events and activities to partake in while visiting the Okanagan Valley. I would like to introduce you to some of the personalities behind the tasting bar at Blue Mountain for the 2014 season! Angela Grant - Although I did take my first wine course over 10 years ago as part of the Hotel and Restaurant Management Program, I think touring the Okanagan really peaked my interest when I saw how much soil, climate and the wine making process can change the way each varietal tastes. Chantelle Bruwer - I studied Marketing Management in Stellenbosch, South Africa. In my final year of studies I met my (now) husband, Ernst - who's passion for wine & the wine industry had an influence on my career choice. Heidi Astles - As a former flight attendant, I travelled extensively, and was fortunate to experience different wines from around the world. Julie Planiden - Growing up in the Okanagan, wine was always in my backyard so to speak. Then I married a chef and had the opportunity to travel and live in many parts of Canada. During these years I had many amazing food and wine experiences. Kornelia Brieke - In the 80's I met Albert Le Comte who introduced me to Gewurztraminer and I have loved wine ever since. Favorite wine region in the world? Angela Grant - Call me biased but I love the wines from the Okanagan! Unlike many other wine regions in the world, there are less guidelines, allowing wine makers to be creative and I love how the orchard fruits shine through in them. Chantelle Bruwer - I'm going to be true to my roots... South Africa. Some of my favourite wine regions in South Africa include Stellenbosch, Franschhoek, the Overberg, Walker Bay, Elim, Constantia & Cape Point. Heidi Astles - I would have to say Australia, my husband and I have visited all of the wine regions there. We especially enjoyed the Yarra Valley, which is just east of Melbourne. Julie Planiden - Although I have travelled, I have not visited many wine regions. So on my bucket list are Champagne, Sancerre, Burgundy, Oregon, Tuscany, Australia, and South Africa. Favorite Grape Varietal and why? Angela Grant - Pinot Noir, it makes my favourite red, can be made into sparkling and also Rose. Chantelle Bruwer - Shiraz, my love for this varietal started when I worked at Raka winery in South Africa. Heidi Astles - Gamay Noir - It is a great red to drink in its youth, slightly chilled. Pair it with red meat, or a rich flavourful fish like salmon. Julie Planiden - Lately I have been drawn to Chardonnay. I think it is a versatile grape variety, extremely food friendly, think halibut, buttery popcorn, lobster, or nothing at all. I appreciate that it has so many incarnations, fully oaked, stainless steel fermented, lightly oaked, malolactic fermentation, the list goes on. Kornelia Brieke - Gewurztraminer as it has nice tropical fruit flavours, spice and sometimes smokiness. It goes great with lots of foods.